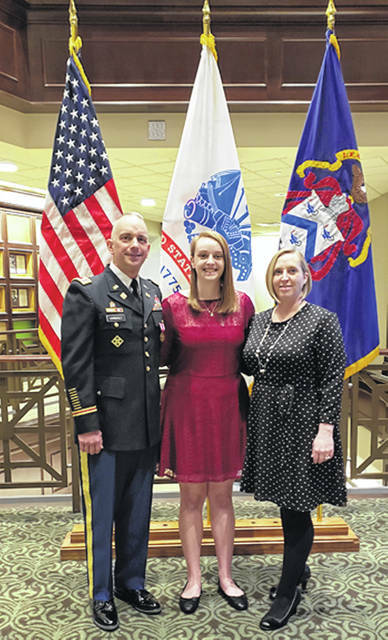 Lt. Col. Wayne Vornholt, left, a Sidney native and now of Leavenworth, Kan., his daughter, Chloe, and his wife, retired Army Lt. Col. Amanda Vornholt, pose for a family photo, recently, before Wayne retires from the Army, April 1. LEAVENWORTH, Kan. — Sidney native Wayne Vornholt will spend his last week in the Army next week. The lieutenant colonel will retire as of April 1, after 22 years in the military. His wife, Amanda, preceded him into retirement by 18 months after also completing a two-decade career in the Army. “We were both in active duty together when we got married,” Vornholt said by phone from Kansas, recently. The two met in the Reserve Officers Training Corps at Purdue University, where Vornholt earned a degree in mechanical engineering. A 1992 graduate of Sidney High School, he played tuba in the high school band and was on the swim and soccer teams. “He had his heart set on Purdue and engineering. With their ROTC program, it all fell together for him,” said his mother, Karen. She, and Vornholt’s father, John, still live in Sidney. “The Army gave me a scholarship,” Wayne said. That required a four-year commitment from him when he got out of college. “Then Iraqui Freedom happened,” so he stayed in longer. And when he and his wife were both at the 10-year mark and halfway to military retirement, they decided to make the Army their career. They started as second lieutenants and for much of the time, they were stationed in the same place. But when one or the other, or both, were deployed abroad, their parents were called on to care for their daughter, Chloe. “I was a company commander in Germany for a maintenance company. During that time, I took the company to Iraq for my second deployment,” Wayne said. “For a little bit of the time in Germany, (Amanda) and I were apart. I was two hours away for nine months.” Then, both of them were deployed to Iraq in 2003. “Three-year-old Chloe came to live with grandparents John and Karen during that deployment year,” Karen said. Now a sophomore at the University of Kansas, Chloe made many friends in Sidney during her various visits here. She also spent time with Amanda’s parents in Indiana. As an older child, her time with her Vornholt grandparents included horseback riding lessons, guitar lessons and doing homework together. In all, Wayne saw two tours of duty in Iraq and two in Afghanistan. Amanda was deployed three times. In the states, Wayne was a platoon leader of a squad of mechanics, attended the Army’s Command and General Staff College for a year at Fort Leavenworth, Kansas, spent three years at Fort Hood in Texas as a support operations officer for the 4th Combat Aviation Brigade, served as an observer/coach/trainer for the mission command training program — “Basically I was a consultant. I would go to staffs and look at process improvement,” Wayne said — and, finally, a professor at the Command and General Staff College. In May 2017, he earned a Master of Science in business with a major in supply chain management from the University of Kansas. That their son went for a military career didn’t surprise his parents. “He was a person that would fit a regimen in daily life really well. That routine fit well with military life,” John said. Like most parents of soldiers, they worried when he and Amanda were deployed. “We’re really proud of all three of them. They’ve done a wonderful job of managing this intense career and raising a daughter,” Karen said. Wayne noted that the Army constantly pushed him outside his comfort zone. “A lot is expected of you at a very young age. As you move up, there are always new challenges. It feels like a negative at the time, but all those scenarios help foster personal growth,” he said. The hardest of those challenges was being separated from his family. “The emotional roller coaster of preparing to go to a deployment and coming back: for instance, when you’re deployed, you have one place to go eat. You do that for a year. Then you come back, and Amanda says, ‘Where do you want to go eat?’ There are so many choices. Or you go to the grocery and there are so many kinds of cereal,” he said. In retirement, he’s looking for a civilian job in his management field and taking time to pursue his hobby of building plastic models of military jets and science fiction vehicles. Reach the writer at 937-538-4827.